cap sleeve leather leather labels for clothing for women dress We have been in the leather and leather garment industry for over 18 years. We have a designing team of 8 people in R&D department, working on the latest design of leather garment and other leather goods. Our goal is to have a win-win cooperation, by helping our customers create and maintain competitive edge in their markets. 1 YRS Guangzhou Hongyun Clothing Co., Ltd. Delivery time Sample order :Within 3-7 working days after payment. After-service you will get reasonable refund in these following cases. 2&raquo; The items that you have received are different to orders. 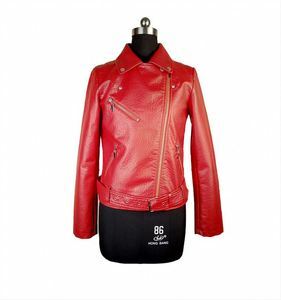 Description X86062A wholesale clothing ladies woodland pu leather motorcycle jacket Model No. 1. OEM / ODM Service Moq: 300pcs each design ; Sample cost is additional 2. Wholesake items-in stocks Moq: 5/10pcs each design ; Sample price is double higher than wholesale price. Packaging & Shipping About shipping cost, pls contact with seller first to comfirm,tks very much! (2) The style, Color and thickness can be customized. Thanks for your browsing and the first cooperation is to be expected. Q5. Can you provide samples9 A5. The initial samples fee is paid by your side, but you can deduct the samples fee in the follow-up orders. 3: How can I get a sample from you to check quality and tailor time9 We will send sample according your design details sent us. 7: What about your delivery time of the jackets9 Can we receive our goods on time9 Usually 10 to 30 days after order confirmed . We&rsquo;ll do our best to deliver goods on time Our Advantages 1. We have our own factory and there are lots of different styles for you. 3. Our factory with 120 workers, make samples in 3 days, bulk production lead time 15 days. The larger the quantity, the lower the average labor cost and the unit price. 5. Q: What is your delivery time for bulk production orders9 A: Normally the production takes 15-25 days depends on the order quantity . our products sell well in mexico, brazil and so on. we are famous for our superior quality, competitive prices, first-class craftwork, safe package and prompt delivery. canen YIHAO Women Classic Motocycle Jackets Faux Leather PU Zipper Short embroidered Biker Jacket Coat Product Name YIHAO Women Classic Motorcycle Jackets Faux Leather PU Zipper Short embroidered Biker Jacket Coat Brand Custom Size S/M/L/XL/XXL etc. We can customize your size guiding Style NO. 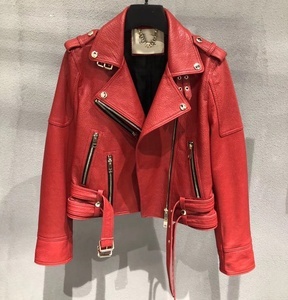 HA17072815 Material PU Design Motocycle Jackets Color Can custom Style Type Casual Sample Time (1) 7~10 working days (1) 10 days busy month MOQ 100pcs per style per color Payment T/T, Western Union, Paypal, MoneyGram,Cash Remark We can provide OEM and ODM service as your request! 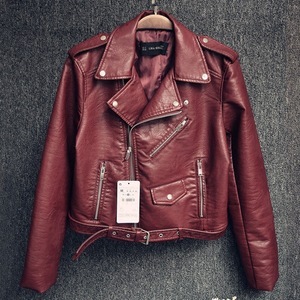 Alibaba.com offers 1,171 leather jackets-motorcycle clothing products. About 57% of these are women's jackets & coats, 24% are men's jackets & coats, and 1% are men's suits. A wide variety of leather jackets-motorcycle clothing options are available to you, such as eco-friendly, anti-static, and plus size. You can also choose from embroidered, plain dyed. As well as from free samples, paid samples. 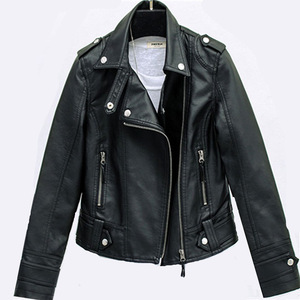 There are 1,171 leather jackets-motorcycle clothing suppliers, mainly located in Asia. The top supplying country is China (Mainland), which supply 100% of leather jackets-motorcycle clothing respectively. Leather jackets-motorcycle clothing products are most popular in North America, Western Europe, and Eastern Europe. You can ensure product safety by selecting from certified suppliers, including 138 with Other, 62 with ISO9001, and 23 with BSCI certification.